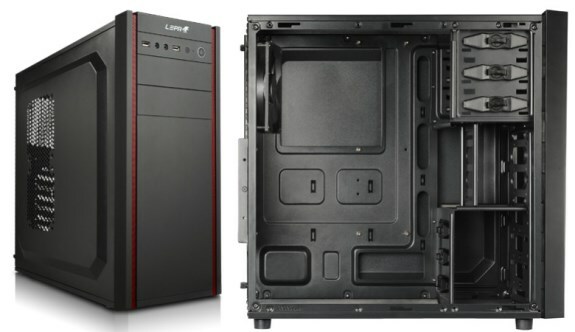 LEPA introduces the LPC306, a low-cost mid-tower with a MSRP of only 39.90EUR (incl. VAT). The case is available with black (LPC306B-B), red (LPC306B-R) and green (LPC306B-G) mesh frame. With the new midi tower LPC306, LEPA releases a classy and functional chassis for representative gaming PCs and workstations. The well-thought internal structure gives room for individual system configurations. The user-friendly mounting mechanisms and various functions allow for a quick and comfortable PC assembling. The LPC306 accommodates up to seven hard disks: Three 2.5" drives (SSD or HDD) can be mounted in the upper cage, while the bottom cage houses three 3.5" drives and one 2.5" drive. In order to improve the fresh air supply from the front, the brackets of the upper cage can be removed. That way, LPC306 also supports longer graphics cards with maximum 390 mm length. Seven extension card slots enable the installation of multi-GPU configurations with up to three graphics cards. For a speedy data transfer with external USB devices, the midi tower provides two USB 3.0 ports which are conveniently positioned on the front panel. LPC306 comes with one pre-installed 12cm fan at the rear side. Additionally, the cooling system can be upgraded with two fans behind the front and two fans at the side panel. LEPA applies a solid rubber coating on the front which effectively shields from scratches and fingerprints. In combination with the coloured mesh frame, the matt black LPC306 with its timeless and elegant appearance is an interesting chassis for users who prefer a decent and clean design.